This print series is based on the Chinese classical novel, The Tales of the Water Margin (Suikoden in Japanese). The novel recounts the exploits of a gang of Chinese outlaws in the twelfth century and the subject was enormously popular in Japan in the mid-1800s. 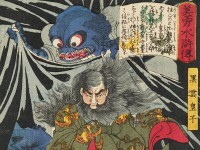 Instead of depicting the Chinese characters from the original novel, Yoshitoshi chose to use his own set of heroes from Japanese history and legend for this series. 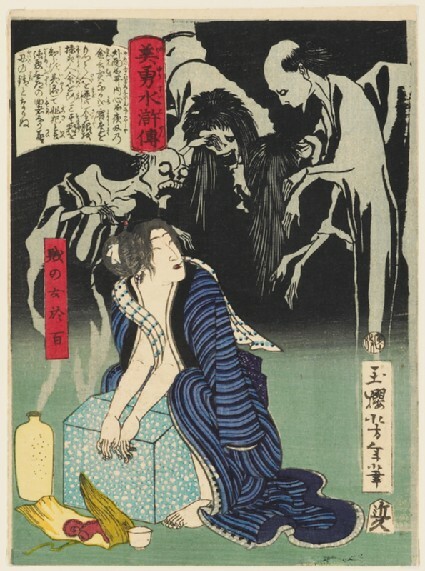 He was fascinated by the supernatural and incorporated several spirits and monsters. The woman who is releasing ghosts from a bottle is the villainess Ohyaku.